Actually, today, several layers came off. In this photo of me trimming the spinnaker, you'll note perhaps the striking blue color of my long johns peaking out below my wind breaker pants. Note also the lack of socks, and no boots. As well, no foulies (foul weather gear), neck warmer, gloves or fleece hat! Every mile we sail south, it gets warmer, but it wasn't until today, about 400 miles offshore south of San Fransisco, a little north of the latitude for L.A., when the layers came off in the afternoon for real. The layers will be coming back on this evening. But hopefully, before long, we will be able to stow away the cold weather clothing. We're also peeling away the miles! Despite starting 8 hours and 125 miles behind the pack, today we are in 10th place (of 12 boats) and seem to be overtaking another two boats. See the white speck in this photo below? That's one off our port beam about 3 miles away. 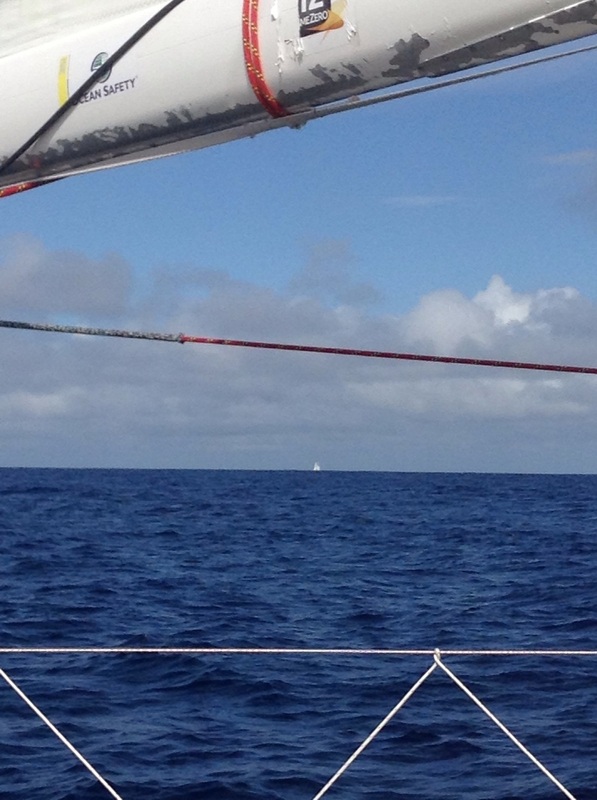 We can see another Clipper Race boat about 5 miles off ahead on our port bow. Our aim is to stay west of them and get the new wind that's coming before they do. Fingers crossed! Newer PostMay 5, 2016 - "We did it!"